In this presentation, the dynamical characteristics of the basic Jeffcott rotor are addressed. The single-mass Jeffcott rotor was first addressed by H. H. Jeffcott in 1919. 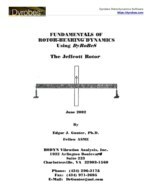 The study of the dynamical characteristics of the Jeffcott rotor is the starting point for the fundamentals of flexible rotor-bearing dynamics. With this model, it was now possible to explain how a rotor could pass through a critical speed. The Jeffcott rotor is a single disk symmetrically mounted on a uniform elastic shaft. In the analysis of the original Jeffcott rotor, flexible or fluid film bearings were not considered. The rotor bearing supports are assumed to be simple pinned end conditions. The unbalance response of the Jeffcott rotor has been described by two second order differential equations to describe the dynamical motion of the system. In Section 2, the Jeffcott rotor is analyzed using DyRoBeS. The critical speeds, unbalance response, and transient motion of the Jeffcott rotor is evaluated. An extension is made of the Jeffcott rotor in this section in which shaft bow is included, as well as unbalance. There have been a number of authors such as Kramer, Dymamics of Rotors and Foundations, who have considered the higher modes of the Jeffcott rotor, including the gyroscopic effects of the disk. The gyroscopic effects of the Jeffcott rotor will not be considered in this section, since it has a secondary influence for a centrally mounted disk. The self-excited instability of the Jeffcott rotor may be determined by the application of internal friction or aerodynamic Alford type of cross-coupling components acting at the rotor center. The analysis of the Jeffcott rotor is very useful, as the computer solutions may be compared to the analytic predictions. The behavior of a multi-stage compressor or turbine through its first mode is very similar to that of a Jeffcott rotor. By means of a critical speed analysis, a compressor or turbine may often be reduced to the equivalent of a Jeffcott rotor by the computation of the rotor modal mass and stiffness for the first mode. These properties are most useful in rapidly determining the bearing optimum properties for that particular rotor.